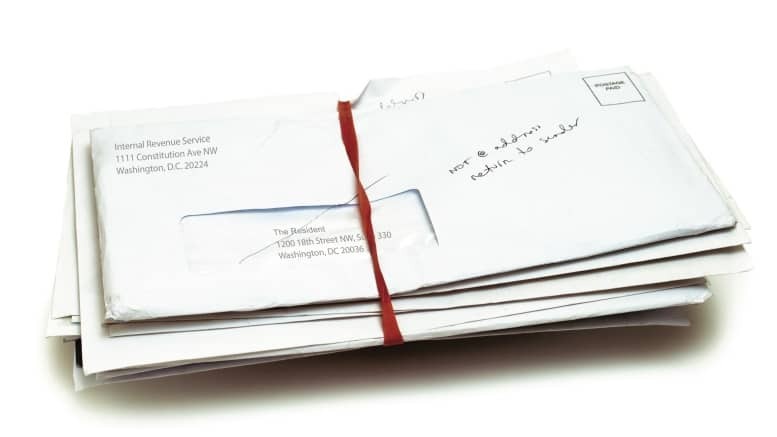 Bundle of mail marked "return to sender" isolated on a white background. April 11, 2019 — These horror stories, along with lesser hassles, all stem from a simple root cause: changing your address is a massive pain. Even in the digital era, crucial communications are sent by mail—addressed to fixed geographic locations, rather than directly to people, which is almost always the intention. After each move, our mailing system requires us to identify all the different people and offices who might ever want to send us mail—government agencies, friends and family, newspapers and magazines, banks and doctors—and then inform each of them about the change. When we leave someone off that list, or if they get the addresses confused, mail goes to our former residence. Although the U.S. Postal Service (USPS) offers mail forwarding, that service eventually expires and is, anyway, good for only one move—creating gaps that result in lost mail and stale contact information. Every year, about one in seven Americans changes mailing addresses. But certain groups—including young adults, members of the armed services, low-income renters, and domestic violence victims—move at rates significantly higher than the average. One study found that more than half of poor families moved to a different neighborhood in a two-year period, compared to around a third of higher-income families. These disadvantaged communities are doubly hurt. Not only do they tend to move with greater frequency, but they also are more likely to be mailed the sorts of things that can be disastrous if missed, like upcoming court dates and crucial bills. But there’s an easy fix. To take the pain out of changing addresses, the USPS should allow customers to register for unique, portable, and permanent “mailing PINs.” These PINs would be connected to your preferred delivery address. Following any relocation, you would simply log in to the USPS website (or stop by the local post office) and change the address linked to the PIN. Anyone who has your PIN will always be able to reach you by mail, no matter how many times you move. No more dealing with magazine subscription service departments or change-of-address forms. No more missed mail after moves.